Read the latest news and information from Visit Sarasota County. For the last 35 years, the first full week in May has been reserved for tourism in communities nationwide; a week to showcase the impact of travel to policymakers, business leaders and local media. Visit Sarasota County also uses this week to celebrate and honor the “Faces of Travel,” recognizing those members of our community who keep the tourism industry thriving. Join us for a special event to celebrate National Travel & Tourism Week (NTTW), the power of travel and the people who make our industry so remarkable. Our Awards Luncheon will be held May 9 from 11:30 a.m. to 1:30 p.m. at Michael’s On East. We are also honored to welcome Visit Florida CEO Dana Young as our keynote speaker, giving us an update on the efforts to improve tourism statewide and describing in her own words why “Travel Matters,” the theme of this year’s NTTW. The travel industry is an indispensable source of jobs locally and statewide. These jobs provide opportunities and paths to prosperity for many individuals and families. The men and women who are the faces of our local travel industry have helped shape travel to be one of Florida’s strongest industries. Book your tickets today! VSC Board of Directors Meeting, April 18, 2019, 4 p.m.
VSC Partner Coffee, April 25, 2019, Der Dutchman, 3713 Bahia Vista St, Sarasota, 8 a.m.
VSC Executive Committee Meeting, May 7, 2019, 4 p.m.
VSC Board of Directors Meeting, May 16, 2019, 8 a.m. Tourist Development Council Meeting, May 16, 2019, 4 p.m., Sarasota County Administration, 1660 Ringling Blvd, Sarasota. VSC Partner Coffee, Circus Arts Conservatory, 2075 Bahia Vista St, Sarasota, May 23, 2019 8 a.m.
All meetings are held at the VSC Administration Office, 1777 Main St, 3rd Floor, Sarasota unless otherwise noted. For teleconference call-in information, contact Shantel at [email protected]. As Visit Sarasota County completes the final draft for the Destination Strategic Plan (DSP) to guide our industry through 2025, we have already taken steps to activate portions of the plan. One of the key recommendations of the plan is to explore the enactment of a Tourism Business Improvement District (TBID) for Sarasota County to create a supplemental funding stream for tourism marketing beyond the Tourist Development Tax (TDT) revenue. A TBID is created when a majority of hotels agree to an assessment to create supplemental funding for sales and marketing efforts. It differs from TDT dollars because the hotels would control of the spending plan for those funds. A TBID, however, must still be enacted by Sarasota County ordinance. This funding mechanism is currently being utilized in more than 100 communities across the country. To help understand the TBID process and whether it might be appropriate for Sarasota County, VSC hosted a breakfast meeting on March 6 with Tiffany Gallagher of the law firm Civitas. Gallagher is a former hotel general manager and has been involved in scores of TBID formations across the country. To learn more about TBIDs, we have posted Gallagher’s PowerPoint along with other information on the public information portion of our website here. VSC Board of Directors Meeting, March 21, 2019, 8 a.m. Tourist Development Council Meeting, March 28, 2019, 1660 Ringling Blvd, 4 p.m.
VSC Executive Committee Meeting, April 9, 2019, 4 p.m.
VSC Partner Coffee, April 25, 2019, Der Dutchman, 3713 Bahia Vista St, 8 a.m.
Visit Sarasota County hosted a two-part education initiative on how businesses in the hospitality industry can make the most of the Google My Business (GMB) features and improve engagement and conversion with customers who may be concerned about red tide. The training sessions are part of a grant from Visit Florida to help areas recover from the negative attention red tide brought. Google is the world’s most popular search engine, and recently started generating “travel guides” for potential tourists to see and use before planning their trips. Have you ever considered what pictures and reviews pop up when someone searches our area or your business? You can control more than you think when it comes to your business, including pictures, videos, reviews and other content submitted by customers. 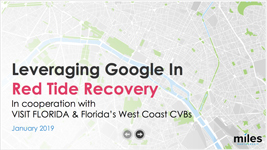 Visit Sarasota County is hosting a two-part education initiative on how businesses in the hospitality industry can make the most of Google My Business features and improve engagement and conversion with customers who may be concerned about Red Tide. The first part of the program was a webinar called “Leveraging Google in Red Tide Recovery Industry” which took place on January 22 at 2:00 p.m. A video link of the webinar is available at SarasotaCountyBrandToolkit.com. The second part is a lunch-and-learn at Marina Jack on February 4 starting at 11:30 a.m. This is a free event, though reservations are required. To RSVP to the lunch-and-learn, email [email protected]. The New Year is here, and we’re looking forward to helping our partners reach their new tourism goals, er… resolutions! We know all of our partners have big plans for the coming year, and we want to remind you utilize the great resources available to keep us aware of what’s going on with your organization! 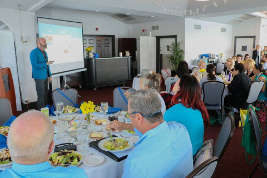 The newest version of our VisitSarasota.com Events Calendar is up and running for everyone to use and see, and is one of the main resources visitors use when planning their trips! Working hard on those press releases? Put [email protected] on your media distribution list to make sure our brand team sees all of those exciting announcements! Partners helping partners is a powerful thing. Ask to join our private partner Facebook group if you’re not a member already. There, you can post about your business and see/like/comment/share what your fellow VSC partners are up to. This is a great place to meet, collaborate and educate others outside our monthly partner meetups! For teleconference call-in information, contact [email protected]. 30,000 face-to-face interactions at our visitor centers and the Visitor Information Vehicle (VIV). That’s 8,300 more interactions than the previous year, an increase of 38 percent. The growth is the direct result of three different factors. Last November, we opened our new downtown visitors center inside The Greater Sarasota Chamber of Commerce building located on Fruitville Road. We also opened a new kiosk inside the Sarasota-Bradenton International Airport (SRQ) which has generated thousands of interactions between volunteers and visitors in just its first few months. Finally, the VIV was deliberately sent to more area events and festivals this past year, helping spread more information about the county and all its wonderful amenities. These interactions are important because they add a personal touch to marketing partner information to visitors. We are providing partner collateral in these face-to-face meetings, information they can spread when they return home, or, for repeat visitors, utilize to experience new activities and accommodations in our area! Tourist Development Council Meeting, November 15, 2018, 4:00 PM, Sarasota County Administration, 1660 Ringling Blvd, Sarasota. The advertising department has been busy preparing the media plan for FY19. We are pleased to present the co-op program for FY2019. Placement opportunities include some of our tried and true leisure travel publications; AAA Living, Garden and Gun and Southern Living as well as niche publications for meetings, arts and culture, LGBTQ and nature enthusiasts. Digital offerings will expand into niche options as well including meetings, weddings and e-newsletter options with Atlanta Magazine. Trip Advisor and Sojern digital offerings will also be available again this year. Please click on the link to review all the opportunities. Any questions, please reach out to advertising manager, Seana Mincy at [email protected]. A company called Hometown Productions is calling on businesses in Sarasota and Manatee Counties selling map advertising. They are representing that they are selling on behalf of Visit Sarasota. HOMETOWN PRODUCTIONS IS NOT WORKING WITH VSC OR AUTHORIZED TO CONDUCT BUSINESS ON BEHALF OF VSC. If you have any questions, don’t hesitate to contact Erin Hurter. Ensure that funding and program development are aligned among Sarasota County, the tourism industry, non-profits and that they meet long-term goals of the community. Provide Sarasota County with tools to evaluate uses of TDT to meet these goals. Identify and assess gaps in the tourism, sports, cultural infrastructure and identify potential new or enhanced tourism demand generators to enhance attractions, events or assets. We have again seen the impact of the increased hotel inventory on our numbers. For June, visitation was up 3.6% higher than June last year and visitor spending increased 4.1%. However, hotel property metrics for June were impacted significantly by hotel inventory increases with occupancy down by 2.2% and average daily rate down 3%. Room nights are up 3.3% based on increased hotel inventory. Domestic visitors from the southeast and Florida continue to grow and Canadian visitation shows slight growth. First the good news for the month of May. The number of visitors were up by 2.7% to 117,100 over last May, due to larger party size which reflects a higher number of families visiting Sarasota County. Their direct expenditures in Sarasota County grew by 3% in May to $113,645,500. Virginia Haley was at Camden Yards in Baltimore to celebrate “Sarasota Day” at a Baltimore Orioles Baseball Game. Joining her were representatives from SRQ Airport, EDC Sarasota County, Sarasota County Government and The Greater Sarasota Chamber of Commerce to help entertain clients from Allegiant Airlines and Baltimore-Washington International (BWI) Airport. We aim for these efforts to add not only more Allegiant flights in and out of Sarasota County – but hopefully to add a specific BWI flight as well. The CEO of SRQ Airport, Rick Piccolo, threw out the first pitch, and “Cooler Backpacks” with both the O’s logo and VSC logo were distributed to the first 20,000 guests! There was growth in visitation for the month of April, despite Easter falling in March this year. The downside is that the growth was not sufficient to drive increases in occupancy and average daily rate with the new hotel rooms. Overall, for the fiscal year, October 1, 2017 through April 30, 2018 visitation has increased 2.5% and visitor direct spending has grown 2.9%. Visitation from Canada and the UK has rebounded to positive numbers. In April, we had visitation growth of 1.1% (132,900 visitors) and direct spending growth of 1.4% ($109,098,200). Hotel occupancy fell -3.4% to 76% and the average hotel room rate fell -0.4% to $203.53. NOTICE TO ALL PARTNERS: As of May 25, 2018, the General Data Protection Regulation (GDPR) will affect harmonizing the data privacy laws across Europe. This Regulation lays down strict rules relating to the protection of natural persons with regard to the processing of personal data. This also affects our cooperation. Starting May 25, it will only be legal to forward personal data with limitations, if at all (e.g. of meetings, press trip participants). So with this new law in place we are not allowed anymore to give out any data information from our contacts without permission and with permission also only linked to certain projects. According to the GDPR, it is prohibited to make further use of the data. It is also a requirement that you completely delete the data within four weeks after the completion of the project (e.g. press trip, event). We would like to advise you to further inform yourself on the new law as you also need to adapt your management with European partners accordingly and it is in the responsibility of each individual to be informed comprehensively. Please find all necessary information on https://ec.europa.eu/info/law/law-topic/data-protection/reform_en. Personal data must be processed in a lawful and transparent manner, ensuring fairness towards the individuals whose personal data you’re processing (‘lawfulness, fairness and transparency’). You must have specific purposes for processing the data and you must indicate those purposes to individuals when collecting their personal data. You can’t simply collect personal data for undefined purposes (‘purpose limitation’). You must collect and process only the personal data that is necessary to fulfil that purpose (‘data minimization’). You must ensure the personal data is accurate and up-to-date, having regard to the purposes for which it’s processed, and correct it if not (‘accuracy’). You can’t further use the personal data for other purposes that aren’t compatible with the original purpose of collection. You must ensure that personal data is stored for no longer than necessary for the purposes for which it was collected (‘storage limitation’). You must install appropriate technical and organizational safeguards that ensure the security of the personal data, including protection against unauthorized or unlawful processing and against accidental loss, destruction or damage, using appropriate technology (‘integrity and confidentiality’). Sales/Media Calls and participation in roadshows, monthly reporting: We are not allowed to share with you the contact details of contacts we have approached during projects on your behalf. We will therefore share with you the company names and websites in the future. Event and fam trip registrations: When we share with you the overview of event or fam trip registrations, we (and you) are not allowed to use the contact details for any future marketing activities, only for the current project. We (and you) are not allowed to share fam trip and event registration lists with details with your partners in the destinations (DMCs, entertainment, transfer companies etc. ), only the details that are needed for the booking are allowed to be shared but need to be deleted after the realization of the project. If the partners ask for a business card during the trip/event, that is of course fine and then not our (or your) responsibility anymore. However, your partners are not allowed to include them in newsletters etc. without asking for a permission. So please be so kind to share the rules and the link above also with your partners. Newsletters/Mailings: We will prepare a mailing for our database and ask for a reconfirmation to approach them with newsletters. If they don’t answer, we are unfortunately forbidden to further contact them. Please also be aware that this might take time. URGENT for All Partners: Check Your Visitor Guide Listings! In order to ensure that your visitor guide listing is correct for 2019, someone from organization will need to go in to the Partner Extranet and approve the listing by June 22. If you do not check your listing for inaccuracies it will be listed in all 100,000 Visitor Guides for one year -INCORRECTLY. It is your responsibility to review and approve. Congratulations to Debra Muenchow with Sarasota Classic Car Museum as our latest prize winner. Debra approved her listing by May 11 and won a basket of VSC goodies. It is so important for you to view your Visitor Guide listing and it only takes a few minutes. Please review your contacts and update as necessary. To be entered in our next prize drawing you need to approve by Friday May 25, 2018. Listing updates for the 2019 Visitor Guide will be accepted up until Friday, June 22, 2018 only. The number of visitors in March was up by 3.5%. Occupancy was down slightly and ADR was up 4.9%. RevPAR was up 4.1% from last year. TDT collections are expected to be up 5.1% above March 2017. 90% of March visitors will recommend Sarasota, and 96% were very satisfied with their visit. 86% plan to return to the area. VSC has begun the Sarasota County Tourism Strategic Planning process with the national firm JLL. They will be in Sarasota County to begin meeting with the community the week of April 16. VSC Board Retreat, Thursday, April 19, 2018, 8:00 AM, Ringling Museum of Art and Design, Chao Lecture Hall, 5401 Bay Shore Rd, Sarasota. National Travel & Tourism Week: Save The Date & Nominate! Join Visit Sarasota County and Keynote Speaker, Chris Thompson, Brand USA President & CEO on Thursday, May 3, 2018 from 11:30 a.m.to1:30 p.m. at the Van Wezel to celebrate the individuals in our community who contribute to making Sarasota County a great place to visit. Say “Thank You!” to fellow colleagues, volunteers and leaders by nomination. Deadline for all nominations is Friday, March 23. Register now to attend the luncheon by April 20. The number of visitors to Sarasota County in January 2018 rose by 1.5% to 80,100. While hotel occupancy was flat to last January at 76%, the average room rate rose by 3% to $183.93. A reflection of the new hotel rooms, the number of room nights sold in January 2018 grew by 3.1% over last January. We had very strong business from Florida, the Southeast and Northeast for the period October 2017 through January 2018. Canadian and UK business remains flat to last year while there is a 2.7% drop from Central Europe. Visit Sarasota County was excited to host 40 plus at our annual Marketing Outlook Summit. At this summit, we reviewed trends we feel could impact the way VSC markets in the year ahead. Following the presentation we met in small roundtable groups to gain insight from attendees on how VSC can shape the plans for the year ahead and be most impactful. For a look at the presentation, click here. Any questions or feedback? Erin Duggan would love to hear from youu, ,[email protected]. Bayfront 20:20 is in the critical process of community outreach and engagement. This is a really important time in our process and we need your help! Please consider reaching out to all in your own stakeholder organizations first and foremost. Next, I am hoping that you can connect with others in your “category” to help stress the importance of this survey and help if needed. If you have a business or organization, please try to get all of your staff and volunteers to take time to participate in the survey. Social media, friends and neighbors can be a big help too! Thanks for your help and let us know if you need additional support! Year-over-year, December visitation was up 3.1%. Occupancy was up 2.1% and ADR was up 3.6%, resulting in RevPAR being up 5.7%. A high percentage (91%) were very satisfied with their trip, 93% would recommend Sarasota and 88% plan to return. 2018 has officially begun, and it’s our goal to make it the best year ever for our industry! Earlier this month we released our 2018 Visitor Guide. This beautiful publication includes sports, weddings, events and festivals, dining, neighborhoods, arts and so much more. Get your copy at our new Visitor Center located at 1945 Fruitville Road. More partner referrals than ever before. It’s just over eight months since our new website launched. Since October, the number of sessions is up 20%, bounce rate is lower by 17%, and users is up 22.5%. Total partner referrals since site launch is 150,623. Since Dec. 26 we’ve averaged 1,336 per day, which we hope will continue through season. Are you attending the Florida Attraction Association 2018 Attraction Regional Forum being held in Ft. Myers on February 6 from 9:30 a.m. to 2:30 p.m.? If so – we at VSC would be delighted to offer you a free ride! RSVP to Erin Duggan at [email protected] by February 1st, and we’ll provide you the car pool details! For more information, or to register, please click here, https://floridaattractions.eventsmart.com/events/2018-attractions-regional-forum-southwest/. VSC Board of Directors Meeting, Thursday, January 25, 2018, 8:00 A.M.
Tourism figures in October FY 18 are up over the past year. Visitors in paid accommodations increased about 4.4% and visitation is up about 3.1%. Occupancy is down slightly at -0.5%. Room nights are up slightly, about 1% primarily due to new inventory. Best wishes to all our tourism partners this holiday season and good tidings in 2018! This year VSC staff delivered some goodies to Booker Elementary, which will be given to various kindergarten classes in need of snacks and basic supplies. The kids insisted, however, that we did not look like elves. VSC Executive Committee Meeting, Tuesday, January 9, 2018, 4:00 P.M.
All meetings are held at the VSC Administration Office, 1777 Main St, 3rd Floor, Sarasota unless otherwise noted. For teleconference call-in information, contact [email protected]. The 2017 World Rowing Championships had a significant positive effect on our September tourism figures. It was the best September on record in terms of hotel occupancy, room rate, number of visitors and their spending. The total economic impact for Florida was more than $22 million. Teams reported a high satisfaction with the event and 86 percent said they would recommend Sarasota as a vacation destination. 85 percent of domestic attendees interviewed said they would return to the area as well. Spending by visitors in September was up by 20.7% to $55 million and the number of visitors in paid lodging grew by 20.2% to 79,900 over September last year. September’s hotel occupancy grew by 10.7% to 61.9% above last September and the room rates grew by 3.1% to $135.63. The strong September helped us exceed our goal for visitors for Fiscal Year 2017 – visitation for the fiscal grew by 4.2% to 1,216,580 visitors in paid lodging and their direct expenditures for the fiscal grew by 6% over the same period last fiscal to $1,097,933,900. All meetings are held at the VSC Administration Office, 1777 Main St, 3rd Floor, Sarasota, unless otherwise noted. For teleconference call-in information, contact [email protected].